Ask the Expert… How do I Declutter? It’s easy to get going and set aside a pile of things to take care of later. With busy lifestyles, those piles start to add up. Eventually, you might have a whole bunch of piles and you might need to declutter. . .
Click on the photo to learn how clutter impacts your mental health. Depending on the amount of decluttering needed, consider tackling the project in portions. Start with one room, area, or closet. By doing this, it will help reduce your stress, make the loads more manageable, and help you keep in the habit of routinely going through piles of clutter rather than letting them get out of hand. Once you have decided on an area to declutter, establish four bins you can use to help keep everything organized. The separate bins should include: a Trash Bin, a Donation Bin, a Put Away Bin, and a Storage Bin. For the Trash Bin, toss items in it that you no longer need or want. The items in the trash bin should not include items that could be donated to a charity, but should include items that are damaged and broken and cannot be feasibly repaired. It could also be separated down to items that can be recycled in your area and items that cannot be and need to just be thrown out. The Donation Bin is anything that is no longer needed or wanted that could better another person’s life. When cleaning out a closet or considering clothes or shoes to donate, ask yourself, “Have I worn this item in the last year? Would I purchase this item again if I needed to? Is this item too much upkeep or needs more repairs than it’s worth?” For more expensive items, if you no longer want them, consider selling them at a consignment store. Of course, some items may be exceptions to the one year rule, like expensive boots or a timeless formal outfit, which can be stored. Take caution with the Storage Bin; only place items in the bin you know you will use again, just not in the immediate future. Catalog or record what goes where, so you do not end up replacing the item because you cannot find where you stored it originally. Seasonal items are excellent for storage bins. The fourth bin is the infamous Put Away bin. The items that need to be put away in their “home” or in their correct spot go in this category. Items should be in working order, regularly used on a daily or weekly basis, and do not take up excess space. If this pile gets overwhelming, reassess what you have in it. Maybe you don’t need 58 pairs of white socks after all. As you declutter, remember to not give in too much to items with sentimental value. The item in question is not equivalent to the love of the person who gave it to you. 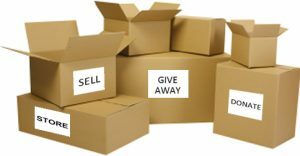 Keeping a few mementos is okay, but allowing numerous mementos to take over your home, is never what the person(s) who gave them to you intended. Make sure any items you decide to keep, have a spot either displayed decoratively or in a “home” just for that item. Do not keep items because you might use them someday. At that point, the only thing they are doing for you is competing for space in your home. Lastly, any time one of the four bins fills up or you have completed a decluttering project, empty the bins and take them to their appropriate spots. For example, bag up the trash and take it to your garbage can or dumpster, label items for donation and send them to the appropriate charities, place storage bins in an out-of-the-way but accessible area, and put away all items you use on a regular basis. I bet you’re asking yourself, what does decluttering have to do with Disaster Cleanup? Here’s the answer: A clutter free home is much easier to restore after a disaster. It’s because the cleanup is about 30% faster than a cluttered home of similar size cleanup. This helps you and your family get back to normal, faster following a disaster. It also allows you to more accurately report losses and damages when necessary to your insurance adjuster. Keep in mind, clutter is very different from hoarding. 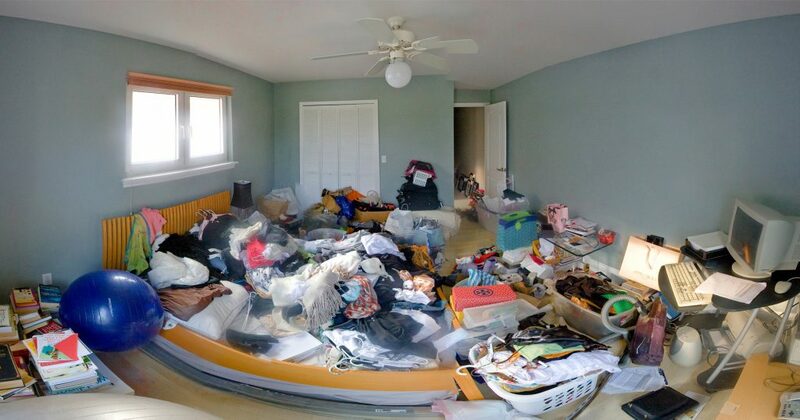 Hoarders suffer from a mental disorder making it very difficult to remove anything from their home or living area without causing incredible distress to them. Special care is given to those who have hoarding tendencies along with very specific cleanup guidelines.